TrueTraveller is a portable forensic kit that provides a complete solution for performing digital forensics Seizure, Acquisition and Analysis. The kit includes a Laptop installed with all software tools and an integrated disk imaging hardware solution. 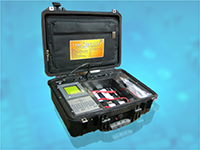 The kit can be easily carried to crime of site and can carry out on-location forensic investigations.